Amazing looking bottle love the way our design printed. Great business to work with. Thanks CEP. No question about it that I will be ordering from Custom Earth Promos agin soon. They are the best in the industry at what they do. 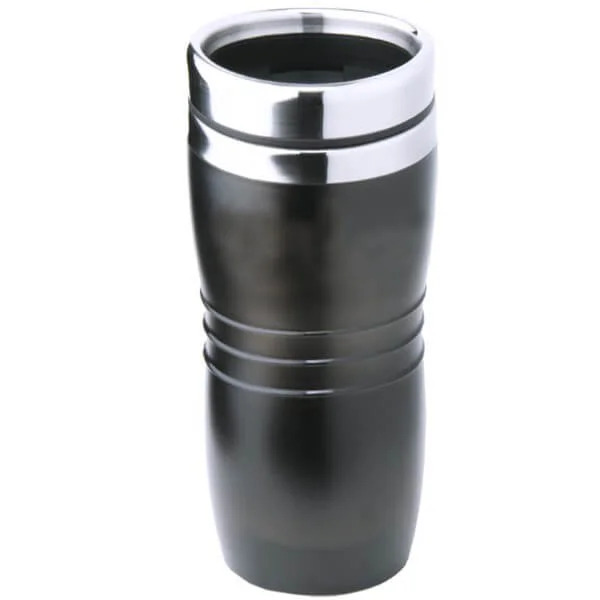 Stunning stainless steel reusable tumbler. All my expectations were met with the amount of designs and color patterns I was able to choose from. I'm really happy with the customized steel tumblers. These reusable tumblers are perfect for marketing your companies logo! Very impressed with how much exposure these products have brought my business! Thank you CEP! Absolutely will be ordering from Custom Earth Promos again. My product came in on time and looked amazing they really go the extra mile! Thanks again CEP. Great printing area to promote our company. A great looking bottle too. Thanks for making this process easy Custom Earth Promos. Great looking bottle love the way our design printed! All my expectations were met with flying colors. I'm really happy with the customized steel tumblers. I ordered these tumblers for all the kids attending our camp this summer. We won't have to use paper cups anymore thus really promoting an eco-friendly way of life. My company logo really looks amazing on the outside of these acrylic tumblers. Customized several thousand of the tumblers for all the events we attend. Its a great way to be eco-friendly and market ourselves too. I really nice way to stay relevant with your customers. "Going Green" is really a way of life and I support the cause any way I can. Great looking and durable. We give these tumblers to all our potential clients as a gesture of good faith. The turn around on when my order was placed, to when it was delivered was unreal. I had my tumblers within 5 days. These stainless steel tumblers have been a great success at our venues. Our logo looks great on them and they get so much use. Cant say enough about Custom Earth Promos. They provided a great tumbler, at a great price and got it delivered in no time. A great addition to the cafe. An earth conscious way to get our name out within the community. Its also a good feeling to be eco-friendly in doing so. 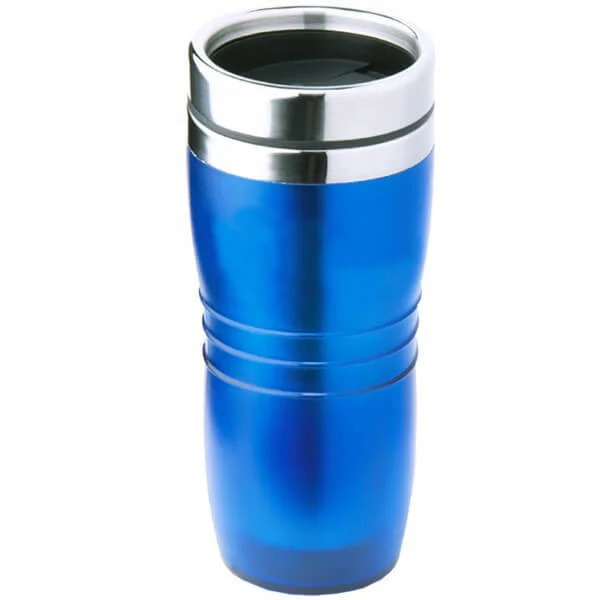 Acrylic Stainless Steel Reusable Tumblers assert an eco-responsible stance of social responsibility and customer concern on behalf of your brand. For an incredible economic value, design an exclusive order of reusable acrylic water bottles that will expose your brand to a greater audience and build brand trust among eco-conscious consumers. You'll work directly with a Custom Earth Promos in-house design expert to build an exclusive order of red, smoke or blue colored 16 oz. reusable tumblers. A tailored, brand-specific graphic will be adorned in the 2.5" W x 1.5" H imprint area of the outer acrylic shell. Build your customer base, empower employees and position your business as an industry leader of the "Big Green Opportunity" with a sustainable product that represents your social and environmental responsibility. Build brand trust among current customers and attract new prospects by communicating your eco-conscious standards. To secure success in our increasingly eco-invested market and sustain the planet for future generations, brands must set strong green standards and widely promote the sustainable strategies they've employed. Publicize the eco-awareness and active initiatives of your brand with a custom design of Acrylic Stainless Steel Reusable Tumblers. Attract new eco-conscious customers and secure loyalty among your audience with a recyclable product that helps the environment with each and every use. By replacing the disposable plastic water bottles that are crowding our landfills, lakes, and oceans with a reusable bottle of recyclable stainless steel, you're helping to reduce the eco-impact of excess waste and crude oil pollution. Your sustainable standards will be exposed to a wide audience of prospects, building positive association as customers carry the eco-friendly tumblers of your brand to work, school, the gym and on shopping trips. Customize your Acrylic Stainless Steel Reusable Tumblers right alongside an in-house design expert to ensure an optimal aesthetic that captures your eco-invested brand. One of our best budget-friendly values, these high-quality reusable tumblers have an eco-friendly design of completely recyclable stainless steel. 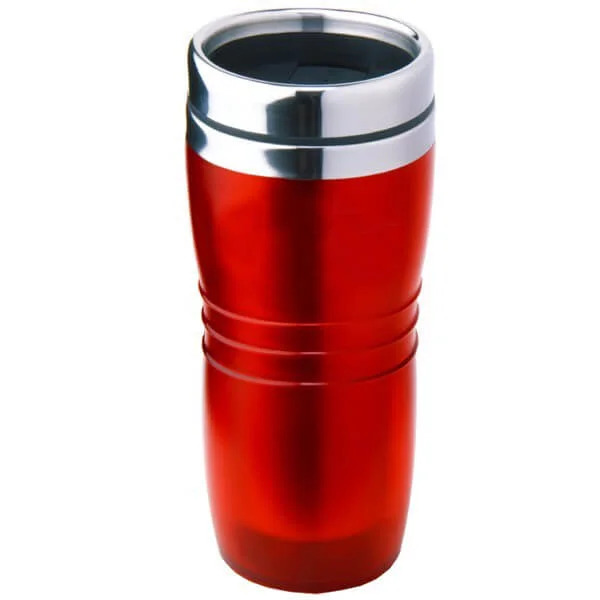 The outer acrylic shell ensures a comfortable exterior temperature, whether customers are enjoying a hot cup of coffee or ice cold water. We'll build an exclusive graphic design to render on the imprint area, placed against an optimal backdrop of red, smoke or blue acrylic. These Custom Earth Promos reusable tumblers feature a triple wave design and modern style. The removable top allows for easy cleaning and showcases a chrome colored finish and slide opening for ultimate eco-friendly convenience. One of our talented design team members will work with you directly, defining the core characteristics of your campaign to build an exclusive order blueprint of Acrylic Stainless Steel Reusable Tumblers that best meets your branding goals. We can even ship you a sample if you prefer to review a physical rendering before placing a full order. Custom Earth Promos will make rush delivery accommodations to meet the needs of our customers. Contact us with the details of your time restraints, quantity, and design requests as soon as possible so we can get to work on fulfilling your order in time for your next corporate event or trade show. Establish your eco-friendly presence now to secure higher sales, long-term profitability and market share value in the future.